Our bodies and expectations don’t always follow the script we wrote for ourselves long ago. She has so much to live for. Stand up to the brain cancer. Know that you’re not alone. We’re praying, thinking, rooting for your mom. For your entire family. But then, something happens that turns everything upside down and inside out. The script goes wrong. The story goes in a direction no one even thought possible. The story, my mom’s story, your loved one’s story, your story, betrays you. When the good fight doesn’t lead to a clear victory, when cancer is not overcome, when a condition is chronic, not temporary, when surgery does not work, when an illness is never diagnosed, then our story becomes a kind of kryptonite that keeps people away when we need them most. So this is something you’re going to have to live with? You mean it’s not going to get any better? Your pain is worth it. The struggle has a purpose. Don’t give up. Your family needs you. Just think of the future. Keep going. When life is interrupted, it’s like someone takes a script everyone had agreed on, crosses out all of your lines, your loved one’s lines, your friend’s lines, and your co-worker’s lines. It’s more intimidating and overwhelming than a blank page, isn’t it? But it’s not blank. It’s an award-winning script that’s now all crossed out—reminding you and others of what is no longer possible. It’s not that we get to start over with a new script—no, you and me, whatever our ages, wherever we are in life—we have to rewrite our lives and our relationships without any preparation or practice. What do we say? How do we respond to what others say or don’t say? How do we connect? How can we make sense of it all when we’re living off a script so few recognize? Welcome back to the Unprepared Caregiver, a community where we find connection in living off script when our lives become interrupted, and we’re forced to reimagine ourselves, our relationships, and everything we once knew to be true. from → Caregiver Challenges, Caregiver Leadership Series, Different Kinds of Care, Feeling Unprepared? I found your blog through Megan Divine (Refudge in Grief) through Tim Lawrence (The Adversity Within). It really resonated with me. I am an Unprepared Caregiver for the last 11 years, since my youngest of 5 children, my son was diagnosed with cancer. Yes, he survived–Woo Hoo –but I continue dealing with his ongoing chronic medical issues. Sigh. Funny, but it took 11 years to realize it was chronic. You wrote: “we have to rewrite our lives and our relationships without any preparation or practice. What do we say? How do we respond to what others say or don’t say? How do we connect? How can we make sense of it all when we’re living off a script so few recognize?” My question is: How do we do this? Is recognizing it the first step? Is it always fluctuating and ever changing? Any thought or comment is appreciated. Thanks so much for your comment. Your insights are profound. Caring for someone with ongoing medical issues brings about the need for new ways of communicating with others and seeing yourself. Your questions about how to live off script have inspired a new blog post. 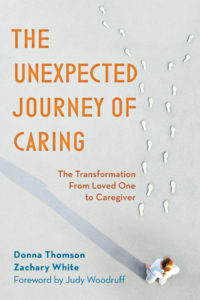 Look for it on Unprepared Caregiver in the next two weeks. Thanks again.